Doctor Who writer Peter Moffat has criticised the furore that greeted the news that the Time Lord's latest assistant will be a gay woman as "nonsense" and said it should be the "minimal level of representation" we see on television. Pearl Mackie, who will play Bill Potts in series 10 of the BBC1 show, revealed this week that her character was to be the first openly gay companion to the Doctor. Moffat said he had been taken aback by "all the fuss" at the news. "In a way there shouldn't be any," he said. "Just to be clear, we are not expecting any kind of round of applause or pat on the back for that. That is the minimal level of representation we should have on television and the correct response would be, 'what took you so long?' not: 'we're so great'." Bill Potts's sexuality is made evident from the first episode, which will air over Easter weekend, which features a female love interest that goes awry. Doctor Who has previously featured gay or bisexual characters, such as John Barrowman's Captain Jack Harkness, Neve McIntosh's Vastra and Alex Kingston's River Song. However, this is first time the Doctor's main companion has been depicted as gay. Moffat said that it was damaging for the younger audience of Doctor Who to make it seem like being gay was anything but ordinary, and said when it came to acceptance of homosexuality, younger people were "much wiser". Mackie said sexuality was not the defining feature of her character and that she had really nothing more to add on the subject. "I think Steven's covered it really. People are gay, so yeah. This series will be the last to be written by Moffat and the last to feature Peter Capaldi in the role of the Doctor. APA 6th ed. : Ellis-Petersen, Hannah (2017-04-06). 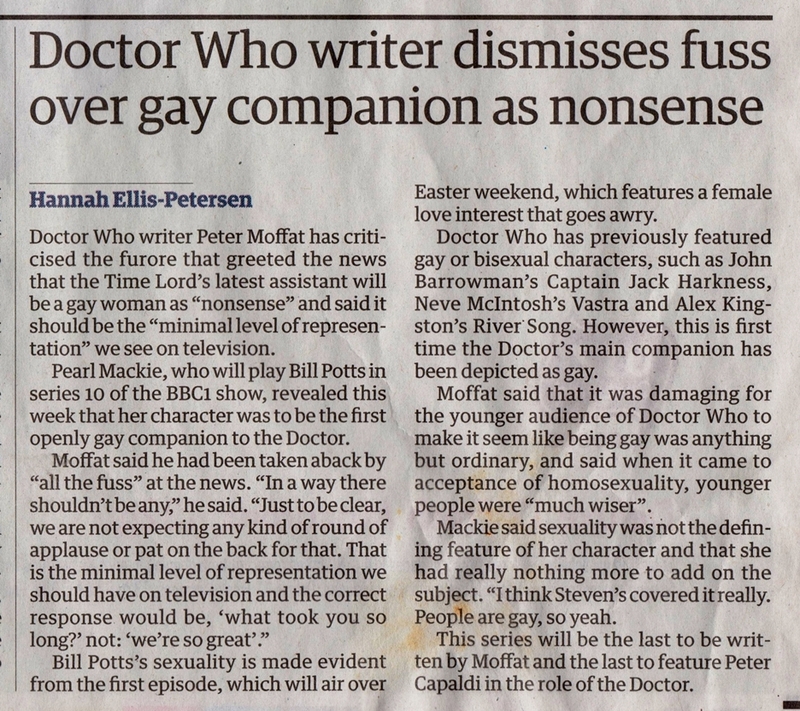 Doctor Who writer dismisses fuss over gay companion as nonsense. The Guardian . MLA 7th ed. : Ellis-Petersen, Hannah. "Doctor Who writer dismisses fuss over gay companion as nonsense." The Guardian [add city] 2017-04-06. Print. Turabian: Ellis-Petersen, Hannah. "Doctor Who writer dismisses fuss over gay companion as nonsense." The Guardian, 2017-04-06, section, edition. This page was last modified on 26 June 2018, at 03:26.